eyes have to readjust after looking at it for more than a few moments. Map showing our route from Paris along the Burgundy Canal. 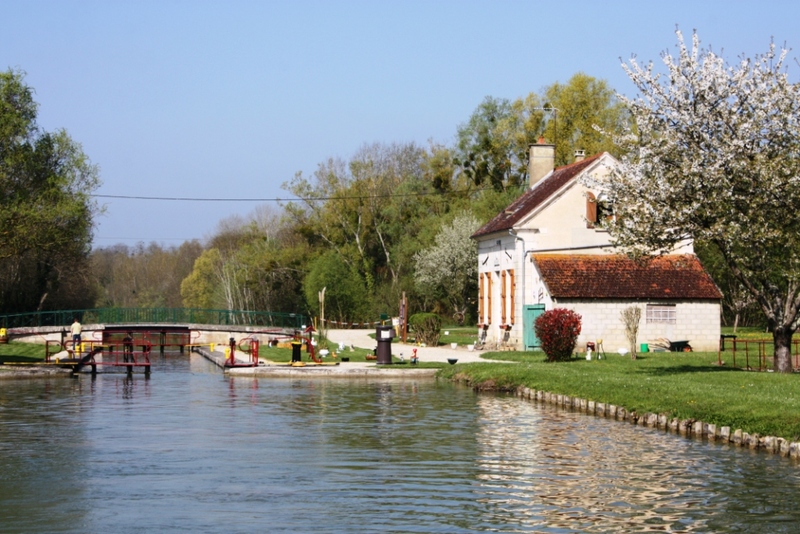 One of the most notable changes, since leaving the big rivers of the Seine and the Yonne, has been the relationship between Lesley and the lock-keepers. The remotely controlled towers along the Seine and parts of the Yonne, impossible to see anyone through the tinted glass. 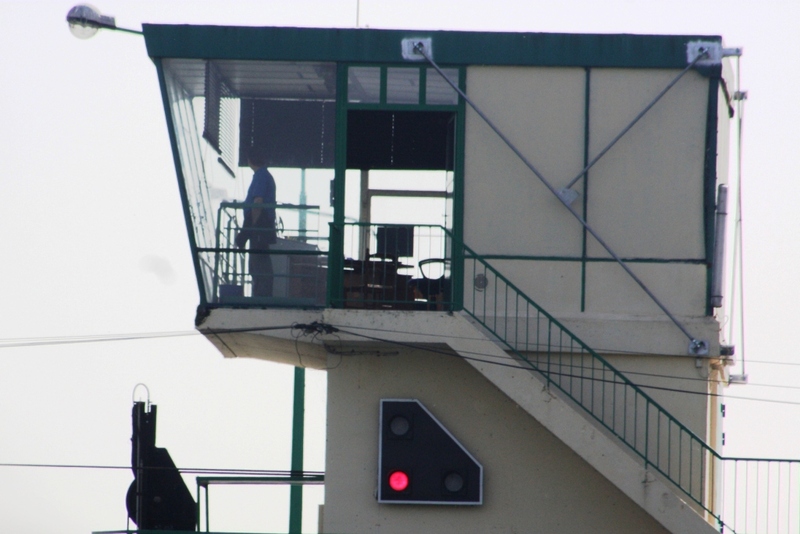 On the big rivers, we were lucky to even catch a glimpse of them behind tinted glass up in their control rooms. Conversations were limited to brief radio dialogue; about opening times for locks and when to enter or not, when to pull up and wait – possibly ‘til the next day, as has happened at least once on this trip. 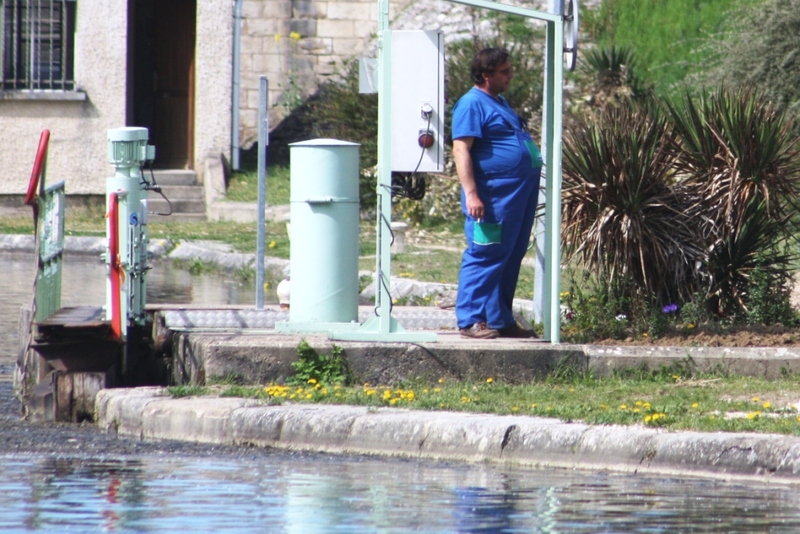 The blue, green and white striped outfit of the VNF lock keepers along the Bourgogne. 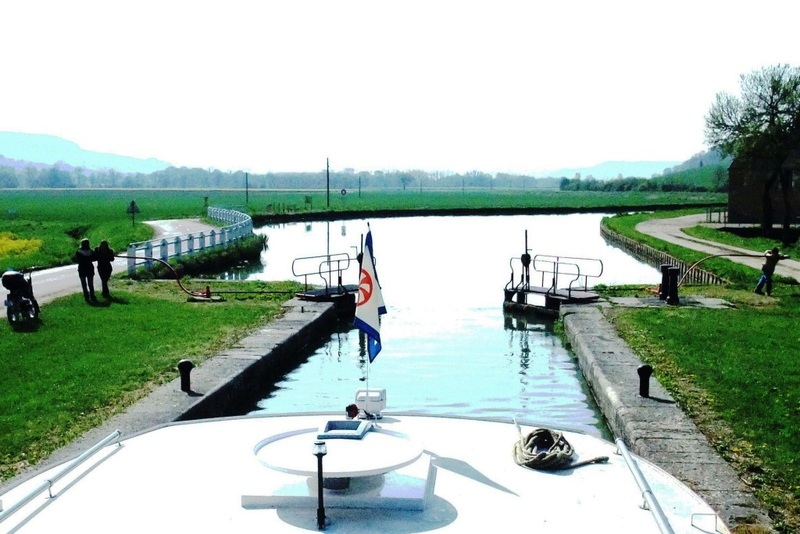 When we started (slowly) up the Canal de Bourgogne, we couldn’t radio or ring ahead as they had no such communication with canal users. Never-the-less, as if by magic, as we approached every lock its gates would be open to welcome us and there, usually in VNF uniform ((Voies National Fluvial or National River Routes, of blue with green highlights), would be at least one lock-keeper, standing by ready to take a rope to help us tie off inside. As things were done manually, rather than then returning to a control room, the lock-keeper would often as not want to engage Lesley in a conversation, sitting down on a bollard to chat for the fifteen minutes or so it takes for the water to flow in or out of the lock. Two young apprentice lock keepers wind the bottom gates closed behind us, wait for the lock to fill, then push the beam to open the other end. They are strong. These chats (almost always in French) covered all kinds of simple subjects; the weather, the town ahead, the best places to eat, best things or places to visit up ahead. Here we have three lock keepers (two young apprentices) to open the lock gates and send us on our way again. Off we would go. Once they had finished closing that lock they would hop on their moped or scooter (which had the very distinct sound of a terribly aggressive mosquito) and buzz past us on their way to the next one a couple of kilometres ahead and the whole process would be repeated. Our young apprentice lock keepers demonstrate how it's done between locks, hop on the moped and buzz there before the boat arrives. Sometimes the next lock would be operated by a brand new VNF person waiting patiently to greet us, or the one we had just farewelled would be there again to shepherd us through the second or third chamber under their responsibility. They were so dependable and so warm, friendly and happy with their work, that saying our final goodbyes was a bit like farewelling friends. Along with a lock keeper, every single lock has at least one lock keeper’s house, not that the lock keeper himself might be living in it. 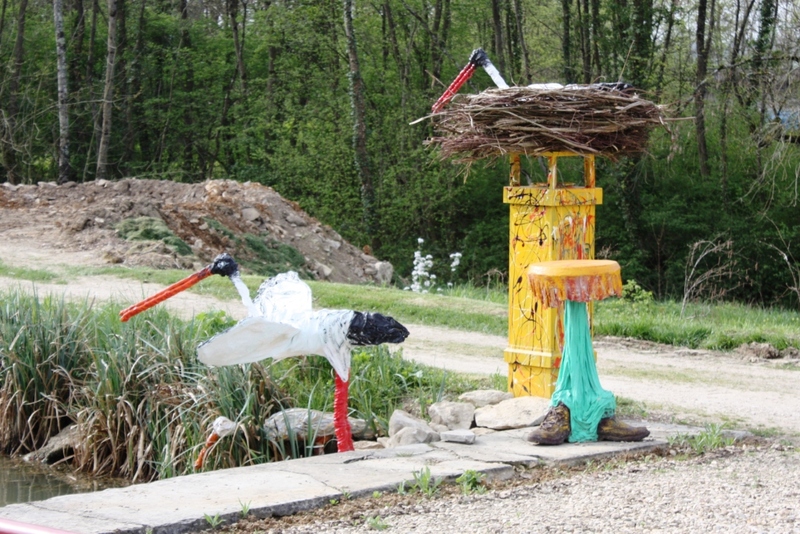 When we asked who created these wonderful sculptures, the lock keeper proudly said "mon mari" (my husband). Some seem to have been rented out or sold off, some are empty and very neglected and some are works of art; legions of freshly painted gnomes, neat as a pin little gardens or at one lock a wonderful; art gallery of quirky sculptures; the work of Madame lock keeper’s husband. This much-loved lock keeper's house has a garden full of gnomes and other interesting characters. As the towns have become smaller, their age has become more and more apparent. 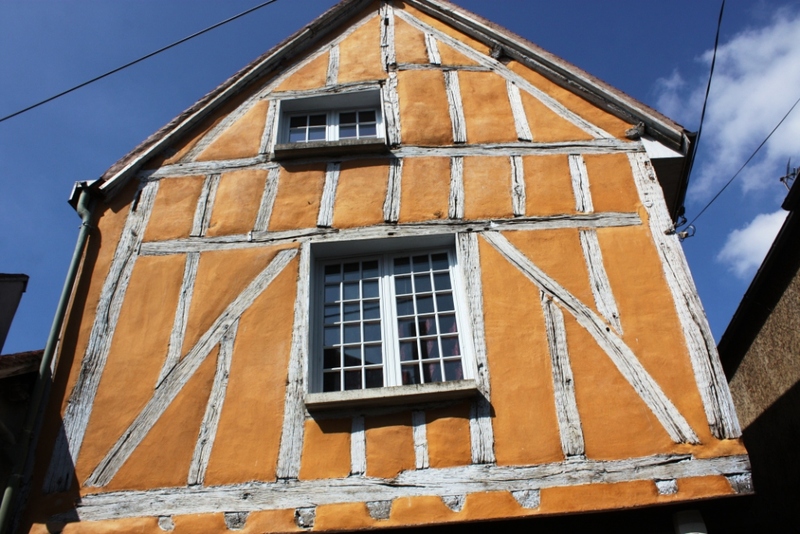 Definitely unique, one of several late middle ages (1500s) houses at St Florentin. This is a region still very much in touch with medieval times. Every town, village or hamlet has its church. Many seem to date from around the 14th or 15th Centuries. We were able to enter the one in Villeneuve-sur-Yonne through a wheelchair accessible side door. Inside it was as if nothing had changed in hundreds of years. 12th and 13th Century St-Jean-Baptiste church at Chassignelles, near Ancy-le-Franc. 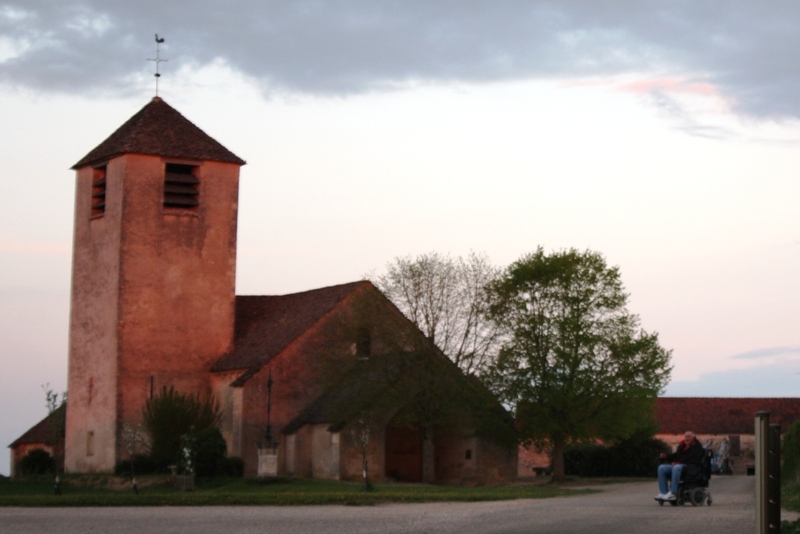 The oldest we have come upon was in Chassignelles which dates from at least the 13th Century. The sun was setting when we got there and the door locked but it stood in total harmony with the landscape around it; a very old harmony. And in many of the towns, houses almost as old are everywhere. In the UK houses with wooden supporting beams on show they would be called Tudor style. We have been often lucky enough to arrive in towns on market days. 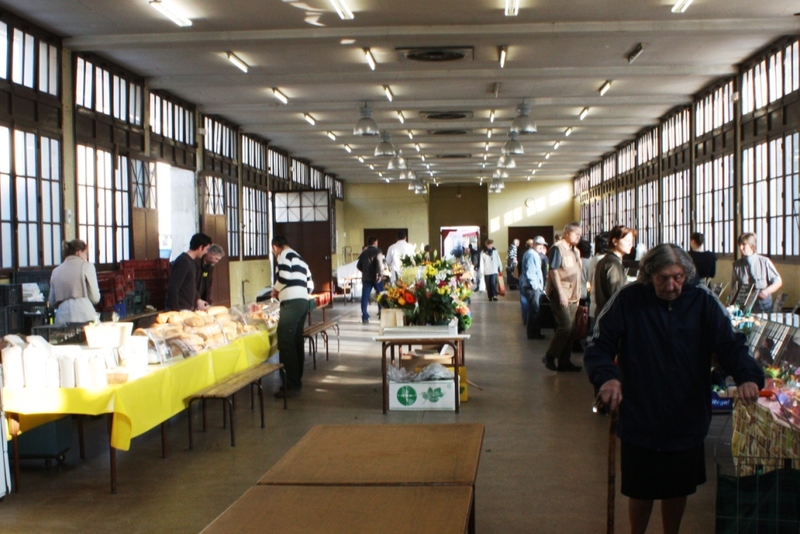 Covered markets at St Florentin, a large open section is outside. Many of the markets are covered by 19thCentenary structures and the townsfolk are all there to stock up. There are as many men as women customers and they line up at popular stalls to buy their cheeses –from vast arrays from all over the country, cold meats smoked sausages and tasty terrines, olives, fresh, fresh fruit and vegetables and of course the breads, all sorts and all works of art with crunchy crusts and wonderful nuts or sultanas as well as the plain and sour-dough kinds. A large public wash at Tonnerre, la Fosse Dionne. 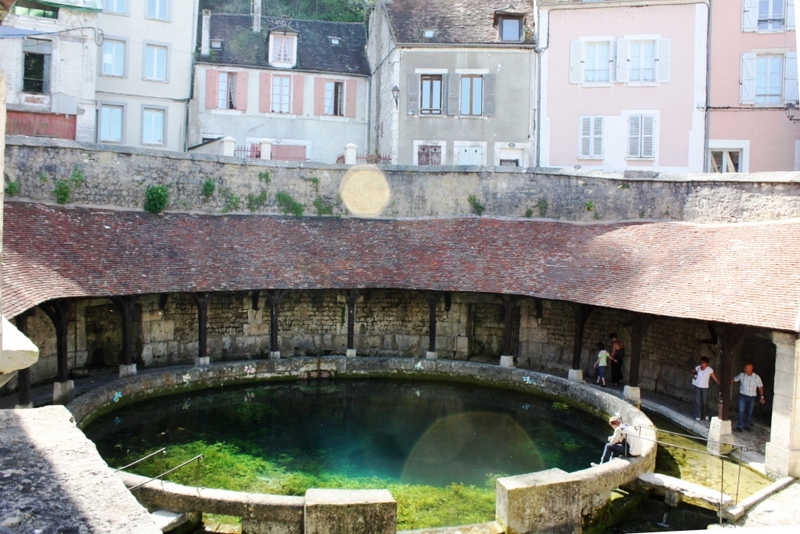 Another interesting local phenomena was the old communal clothes washing pools dating back from at least he 19th Century or older, called Lavoir. Nearly every village had one. The surrounding buildings and the source of the water varied – some were built close by a stream or the canal and the most intriguing in Tonnerre, was over a spring fed from a cave below. At least two people had died, trapped having dived down to further explore the system. The food in restaurants and brassieres is a lot less complex than our favourite restaurants in Paris but just as delicious. Most of what we have eaten is home-cooking style with fresh local produce without a lot of complexity or garnishes. And it’s not been expensive. We rarely pay more than the equivalent of $75 for two courses including wine for the two of us – naturally this is for a big night out after many days of hard work. 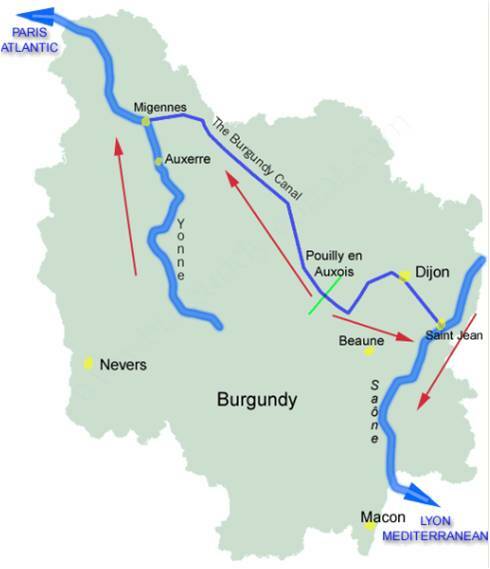 You may find this map of the Burgundy Canal useful to get your bearings (if needed): http://www.burgundy-canal.com You will see the canal is 242 kilometers and has a daunting 189 locks, with one long 3.333 kilometer tunnel at the summit, now mostly all behind us. The website even shows how the locks operate in this section of the waterway. 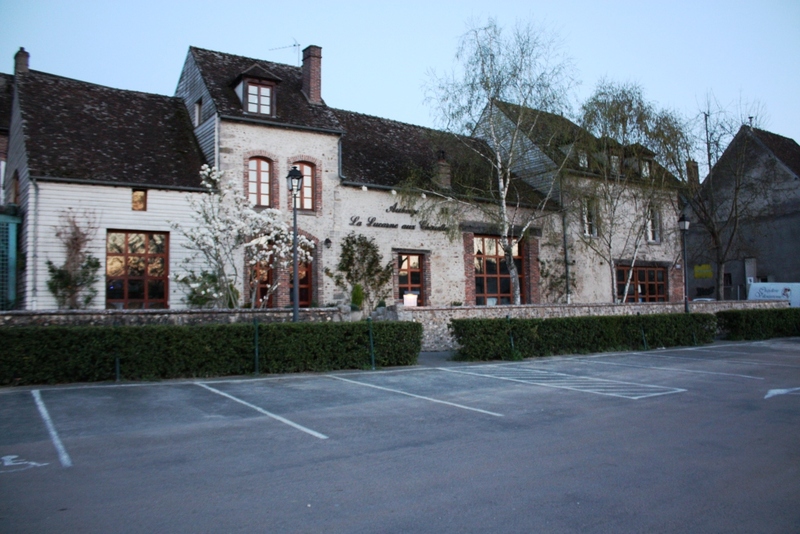 Spots we have tried and enjoyed since leaving Paris range from the elegant but not expensive Owls Nest at Villeneuve, to Tante Lisette in Ravieres and the Hotel restaurant de l’ecluse, in tiny Chassignelles. At Villeneuve-sur-Yonne one of our favourite restaurants, The Owls in the Skylight (La Lucarne aux Chouettes) has Leslie Caron connections. Two courses and a small carafe of wine at around 50 Euros, equates to just over $35 each. pleased to know we pointed this out and felt we had on this occasion, to leave a tip, something that’s not generally the practice in France. We’re quite happy to be sharing this amazing find, but given the time it takes to get there, by canal at least, I fear he is not going to be swamped by customers just from reading this Blog! 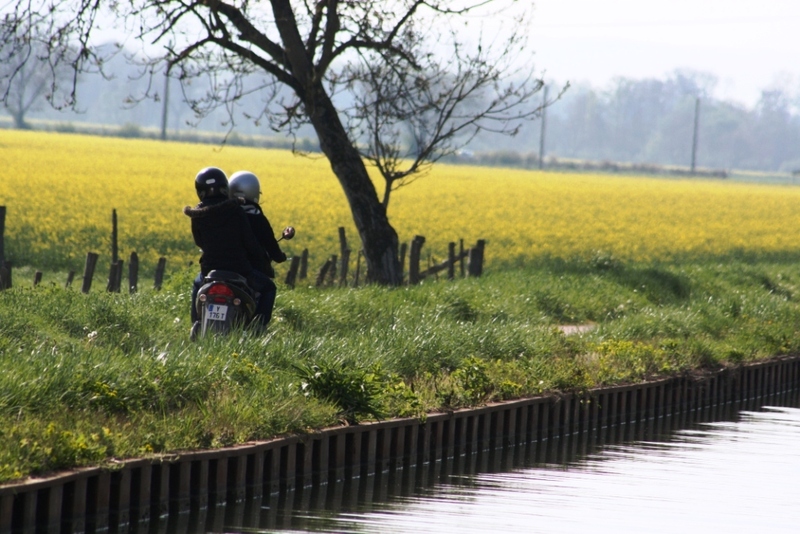 As we said in our blog a few days ago, by the time you finish reading this we will be about to enter a whole new world, again.. with the end of the Canal de Bourgogne we will turn left onto the River Saone heading for the Champagne region .. faster the better we say. Well, at maximum 6 kilometres per hour! This entry was posted in Accessibility, Waterway life, Waterway services and tagged Endellion barge, Facts and figures, Travel, Wheelchair access. Bookmark the permalink.